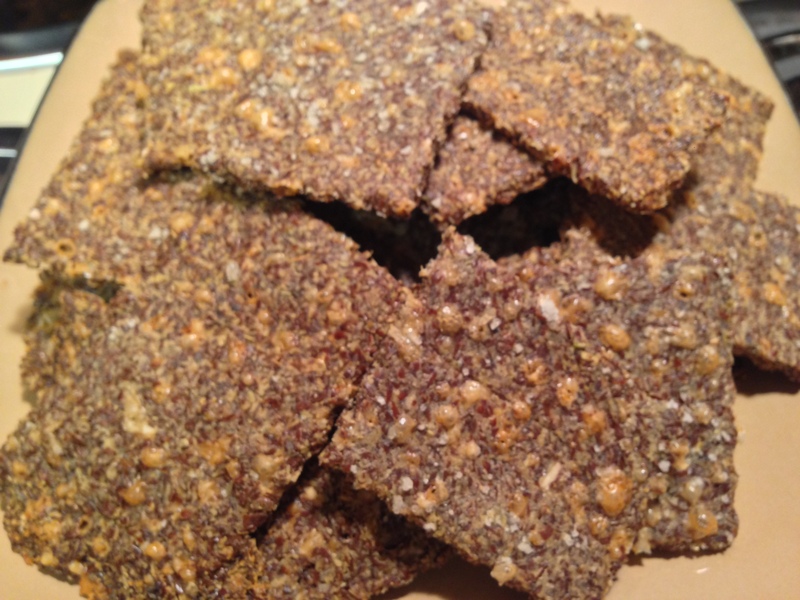 Well since I’m too cheap to pay the store prices I decided to try making them on my own, and found a great Rosemary & Seasalt Flax Cracker recipe in The Gluten Free Low Carber by Mellissa Sevigny from ibreatheimhungry.com.. Going vegetation I’d almost gotten rid of her cookbook being as most low carb recipes are meat based, but I’m glad I kept it for such an occasion as today when I found myself on the prowl for a healthy snack option to take to work. The big bonus is that it barely put a dent in may pocketbook. I made these crackers with eggs from our chickens, rosemary which we also have in our garden for next time, added in some parmesan, celtic sea salt, and flax meal which are things I always have on hand. In less than an hour I have a great snack to help satiate my appetite during the day. Now to think up some other flavor options in these little tasty treats. Here is a pic. Didn’t take time to pull out the real camera. So I just used my iPhone to save time. Filed under Food and tagged cooking, food, lacto ovo vegetarian |	Comments Off on Flax-Crackers …Yum?? ?